I have found the answer to saving money AND time with homemade pizza for my family! That answer comes in the form of Greek meets Italian cuisine! I saw many people do this before but for some reason it just never clicked. Pita bread as pizza crust. So simple! I used to buy the specific ready made pizza crust and I would get them for two for around five bucks. Still a bargain compared to takeout prices. Here's the breakdown of my ingredients cost, approximately. Pita bread cost me 2.50 for eight pitas! (I used four for dinner, $1.25.) Pepperoni,$5 (of which I froze half and used 1/4 of the package, $1.25 ) mozzarella block, $5, (I used less than 1/4 block for four pita pizzas,$1.25,) homemade garlic and herb tomato sauce using canned tomatoes, pennies, .10 1/2 a chopped white onion, .10, 1/4 green pepper .20. So, for four pita pizzas I estimate that I spent a grand total of : $4.15 or $1.04 per pita pizza! Not to mention that I have more than enough ingredients for another meal, and if I buy more pitas, three more pizza meals, at least! This is the type of frugal finding that excites me these days. Go ahead, make fun. I don't care. I'm eating pita pizza! I especially like the thin crust option, and the fact that my pitas were wholewheat. I also enjoy the fact that it switches up the homemade pizza menu. I have been experimenting with different types of crust and for ease and price, so far pita pizzas are in the running for first! 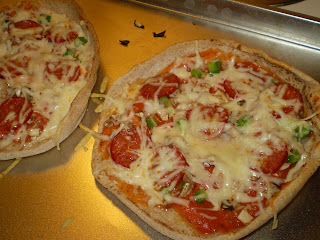 We were so excited to eat our pita pizzas that we couldn't wait for Friday night and had them on Tuesday instead. Now, that is living dangerously! Leprechauns took over my blog! Welcome spring! My cheapness makes me healthier?